...and you thought your gaming chair was sweet. 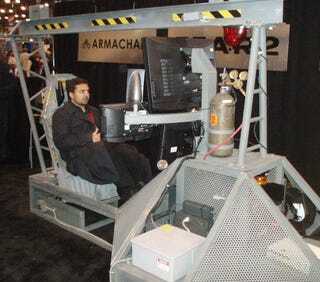 This was certainly the most immersive gaming display at the New York Comic Con. We got a look at this contraption a few weeks ago at a Gamestop in NYC, but now we're finally able to see everything. The chair gives you real-time feedback on your heart rate and something the rep on hand said was a "tension meter" that somehow is able to determine how tense you are while playing.